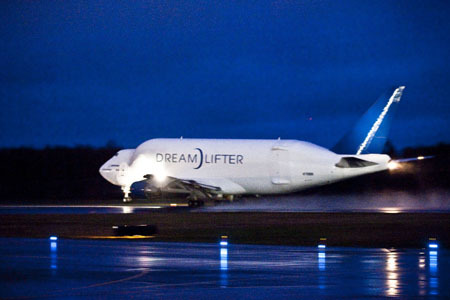 EVERETT, Wash., Feb. 16 /PRNewswire-FirstCall/ -- The fourth Boeing (NYSE: BA) Dreamlifter – the final airplane in the fleet of specially modified 747-400s – entered service today. Dreamlifters transport the large composite structures of the 787 Dreamliner from partners around the world to Everett, Wash. for final assembly. The unique airplane, which was modified by Evergreen Aviation Technologies Corp. in Taipei, Taiwan, took off from Paine Field in Everett early this morning. Bound for Wichita, Kan., the Dreamlifter is returning the equipment used to transport the forward fuselage section known as section 41. The airplane's registry is N718BA.